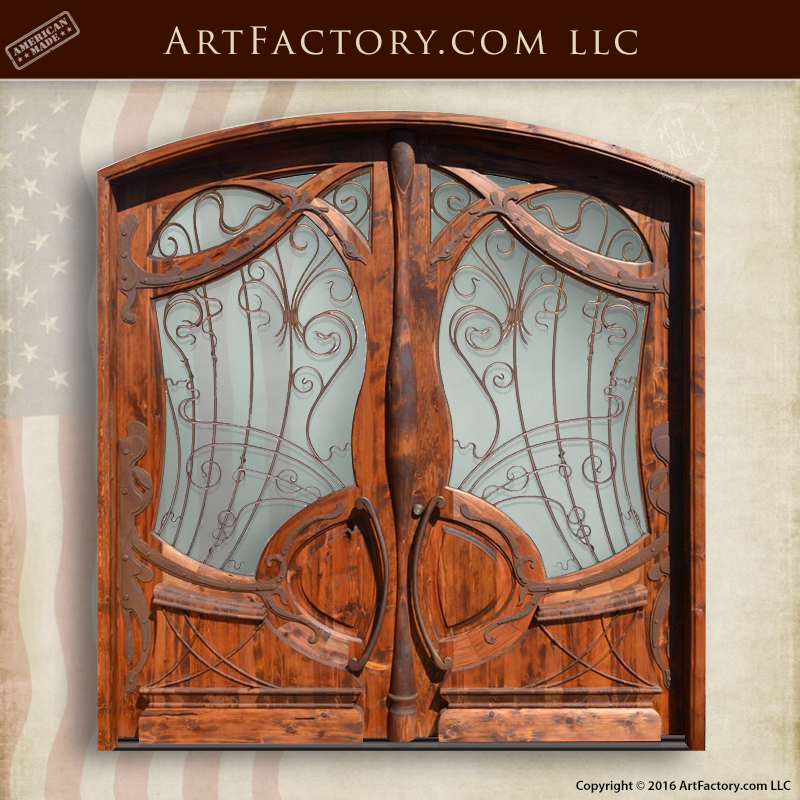 This custom, Art Nouveau style, Jules Lavirotte inspired door by ArtFactory.com is just one of the unlimited variety of door styles that we offer. Most importantly, all of our historically inspired doors are built in original craft. That means built in the same hand and materials as the originals, for a unique, fine art quality product that is built to investment standards with future antiquity value. These doors are not machine made, mass produced, of made using any kind of fast process. This means that your custom door will be built by the hands of our master craftsmen, all while under the supervision of world renowned artist and designer H.J. Nick. Not only are our doors build individually by the hand of master craftsmen, but are also constructed from only the highest quality, all natural materials. This includes full length, naturally air dried, American timber, energy efficient, dual pane glass, and solid blacksmith forged, wrought iron hardware. That means that all of our ironwork is built by the hand of classically trained blacksmiths, using hammer and anvil over a coal fired forge. Furthermore, all of our custom doors are built using mortise and tenon joinery for construction that will stand the test of time. Call us for a quote today at 1-800-292-0008, we ship worldwide. This door is artist H.J. Nick's modern interpretation of of one of Jules Lavirotte's most famous doors. 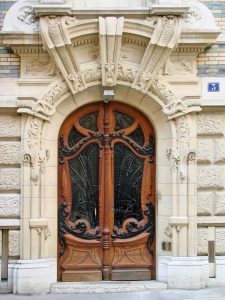 Inspired by the door found at 3 Square Rapp in Paris, France, this modern, art nouveau style door is sure to turn some heads. 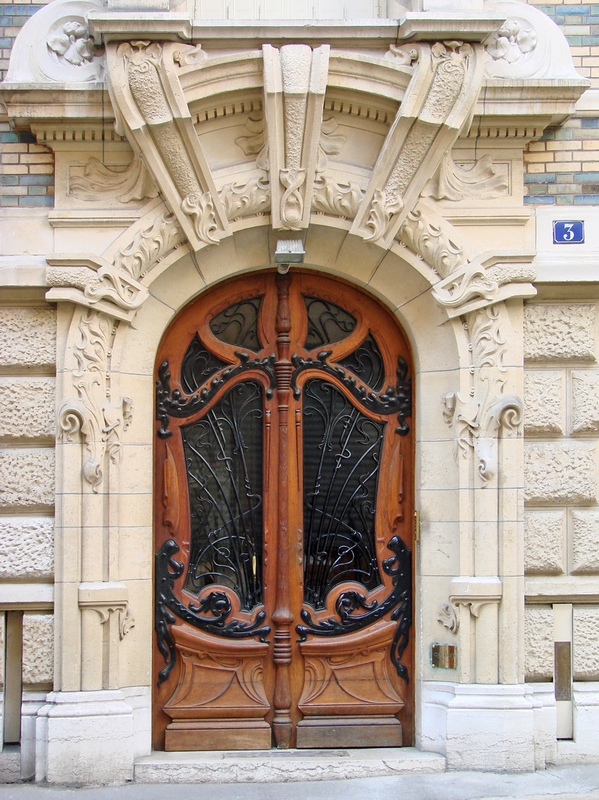 Lavirotte, who is famous for his flamboyant, Art Nouveau style of architecture, built the original door and building in 1899. Jules Lavirotte studied at the Ecole nationale superieure des Beaux-Arts in Paris, the most prestigious art school in France. His building at 3 Square Rapp is an unusual mixture of architectural pieces including a turret and individually styled balconies where no two are the same. His whimsical approach to the wrought ironwork on all of his buildings is well known and he included that ironwork in his doors. The flamboyance of the Art Nouveau style combined with his daring and intricate designs makes all of his work unique and recognizable.